When it comes to the little ones in our life, we want to make sure that they are well protected against the sun as well as comfortable while on the golf course. In fact, there is no other pleasure for a parent than to have their child partake in a game of golf. Not only do we feel proud, but we also feel excited to show them how to play. With that, we also want to guarantee their protection, comfort, and safety while on the course, and it starts with the right outfit. Below are ten different golf outfits for both girls and boys that parents will love as far as design and appearance. Let’s begin! As the first item on the list for the little ones, we want to share a brand that excels in the area of design, aesthetics, and quality. With that, they have designed this next product to have the many features as their adult clothing but with a heavy concern about the fact that it is for a little kid. 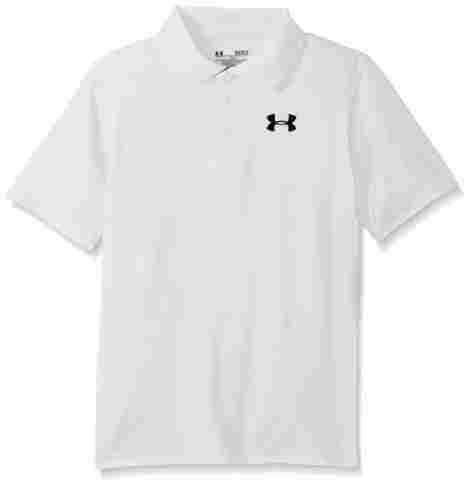 Here are two features to consider the Under Armour Boys Match Play Polo Shirt. This fabric is particularly designed for little kids. The fabric happens to be a very soft fabric that is comfortable but also highly durable. For instance, the fabric is designed to be anti-pill and anti-snag. The reason being is that the brand acknowledged that little kids may be less careful with their clothing. Therefore, quality and durability is the main concern. Part of the quality of this product is the four-way stretch construction that makes the product even more comfortable to wear. A four-way stretch fabric allows individuals to easily use the product and allows the kid to not be hindered by movement when wearing the item. More so, the fabric is comfortable and allows for an all-day wearable experience. To discuss cost and value for this product, it is important to note that this fabric is one of the highest qualities in the industry and this brand is one of the most touted for their expert quality designs and highly durable construction. With plenty of color choices available, individuals can expect for it to be a comfortable shirt for any child personality. So, if you want to gift your son the best golf shirt in town, there is a reason this one is number one. UPF protection to protect against the sun’s rays. Four-way stretch for all day comfort. Made for children to be comfortable. This next product may be one of the cutest in the industry for little girls that want to be on the golf course with mom or dad. This particular dress is high quality while also boasting a golf-polo look that cannot be underestimated as far as design quality. 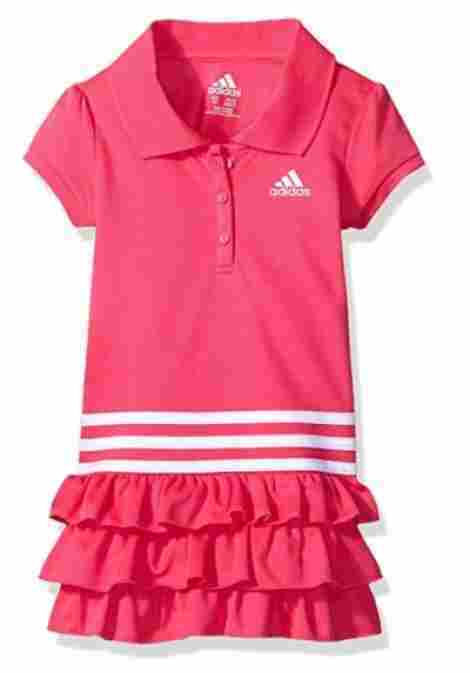 Here are two features to consider the Adidas Girls Active Dress and what individuals can consider. This product comes with a quality fabric that is intended to last. The dress is made to be 100% polyester. However, it is still highly comfortable and very stylish as far as design. With that, polyester is known to offer excellent value and excellent long-lasting benefits. If you have a picky daughter that wants a beautiful dress, why not wow her with this product? This dress actually has one of the largest color selections in the industry. The design is beautiful, and the color choices include teal, pink, bright pink, and even white, so your angel can choose the best shirt for her. As far as price and value, this product is very stylish for the girl golfer. With that, this brand is known for their excellent customer service and high-quality appearance. Now, this does not mean that style takes a back seat to quality and comfort. This product still happens to be one of the best quality available today as a child golfing outfit. Quality product made to last. Comfortable fabric that is stretchy. Three special sizes to consider. We are not familiar with this brand and we have not talked about them before. However, considering that this product has five stars, we want to say that this may be one of the best golf shirts for little kids in the industry today. Designed to last and very comfortable for all children, we want to share the Jolt Gear Youth Boys Golf Shirt and two features individuals can expect of this particular product. It goes without saying that one common theme among adult golf shirts is the fabric design. 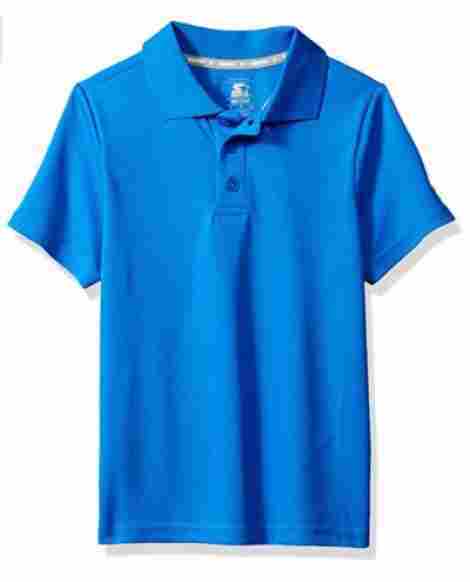 Most fabrics for adult golf shirts are made to be durable, long lasting, breathable, and also moisture wicking. Well, this fabric has the same features. This fabric has the Dri-Fit golf comfort technology that we have come to know. This fabric is intended to keep the child cool and comfortable all day on the course while hanging out with mom or dad. This shirt is intended to be highly durable and be able to put up with many washes. With that, this product is a machine-friendly washable shirt that is designed to be snag-free, anti-pill, and also fade-resistant. More so, the product has a four-way stretch polyester and elastane material quality that is intended to offer long-lasting benefits and minimal wear and tear, which can happen to kids clothing easily. With this in mind, this product is highly durable, stylish, and very traditional for any child. With that, the little kid will look like a gentleman on the golf course and with a large variety of color choices, there is a color choice for every day of the week. With this in mind, the price may be one of the most shocking elements of this product considering that it has one of the best fabric designs in the industry. Breathable and cool lightweight fabric. High quality and durable dry-fit material. The red color choice is more of an orange. This next product is a high quality and beautiful dress for girls that want to stand out on the golf course. The only thing missing is a set of kids golf clubs. 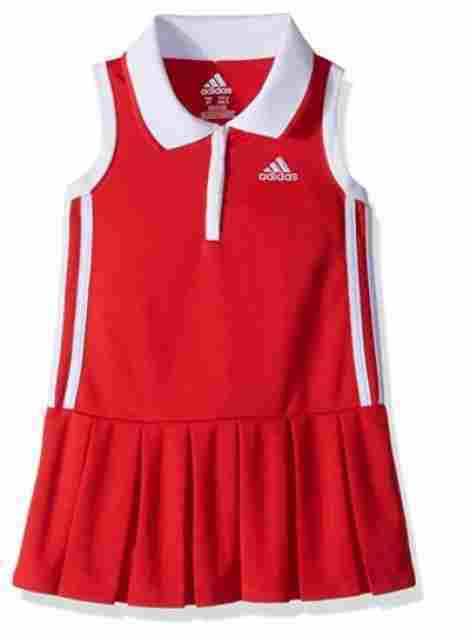 We want to share the Adidas Girls Yrc Dress and two unique features and benefits of this particular product. With that, if you are considering a quality dress for your daughter, we recommend this product considering that they have an excellent track record of producing excellent products and four color choices to choose from. The material composition of this product is a 100% polyester shirt that is long lasting and designed to be snag free. With that, this shirt is also made to be anti-pill and snag-resistant so parents can rest assure that the product will not rip anytime soon. Alongside this, the stitching is superb and the shirt is even machine washable to make it simple for parents to wash the product after a full day on the golf course. This product comes with what may be one of the most beautiful color selections for girls golf dresses in the industry. The reason being is that the colors are stylish and beautiful pastel colors that are made to be durable and long lasting. Alongside this, the colors are designed to be fade free and stylish. We are not surprised at the parent that wants to collect them all. Now, if you want to collect them all so your daughter has a nice selection to choose from for today's golf game, well price is a concern. The price will vary depending on the size and the style. With that, individuals can expect the price to reflect the fame of the brand alongside the durable design benefits of using their quality products. Overall, we recommend this girl dress for the style and the durability. Four color choices to choose from. May get kind of warm due to lack of breathability. 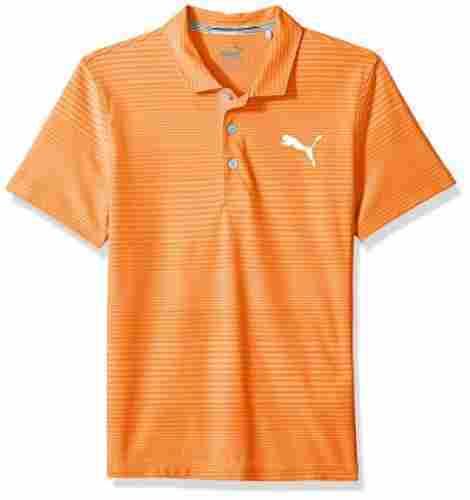 Coming to the middle of our list and we want to share the Puma Golf Teen Boys 2018 Aston shirt. This brand is known for their excellent quality materials alongside the benefits of wearing their products. 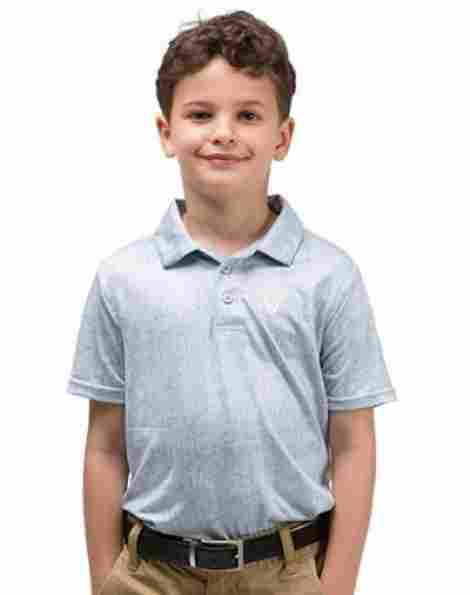 Well, these benefits have transcended towards the design of this kids golf shirt and what is even most unique, is that it comes with a very stylish and traditional stripe design that makes the shirt look very classy. Here are two benefits of buying this shirt. If you are familiar with Puma, then you know that they have one of the largest and high-quality collections in the industry when it comes to quality and design. Their product is durable, stylish, but also have a slew of features that make the brand notable across the sports industry. One of their features is dryCell Technology, which is a moisture wicking fabric that guarantees maximum comfort and breathability to the individual wearing the shirt. Part of the quality of this product is that it actually comes with UV-protection. If you are a parent concerned about your son out in the sun, then this is the shirt to get. With UPF 40, this product is designed to protect against the sun’s harmful rays. So, if you are going to get yourself a UV protection shirt, get your son one too and this one is the best one to get. As we said above, this brand is known for quality and their products are known for their excellent design benefits. The value for this item is reflective in the cost and parents can expect it to cost a bit more considering that this brand is a premium brand. With that, this shirt comes in a large variety of color choices available and it is known as a performance fit offering excellent value. Comfortable for the kid wearing it. 100% polyester is durable and snag-resistant. dryCell fabric for better breathability and moisture wicking. Performance fabric for better breathability. As one of the most excellent brands to consider, this brand is known to supply many features from premium brands without the premium brand price. Here are two features to consider the Starter brand and their boy's golf shirts. With four color choices, parents can collect all three for the price of one premium kid's golf shirt. Let’s talk about the features. This product comes with this brand’s Dri-Star fabric, which is a specialized fabric intended for many benefits. This fabric was quality produced by this brand and intended to offer excellent design benefits. The fabric is designed to keep an individual cool and dry and also wick away moisture quickly and effortlessly. Overall, this feature makes the product even more durable and comfortable to wear. This product is intended for the picky little golfer that wants a comfortable shirt to wear on the course. The shirt is very stylish, high quality and simple in the design. With that in mind, it fits kids with a relax fit look that can make the shirt bulky but also makes it more loose fitting and breathable. To discuss cost and value for this item, it is important to note that this shirt is coming from a brand that focuses on reasonable price ranges alongside comfort benefits. With this, this item is made of 100% polyester and can easily withstand the test of time, especially considering the mess kids can get into. For the parent, it happens to be an easy to wash shirt as well. Overall, we recommend it for parents that want a quality and durable shirt for their little one. Dri-Star fabric wicks away moisture. If you are taking the most little one in the family out for a game of golf or put-put, we want to share this very cute and adorable outfit. 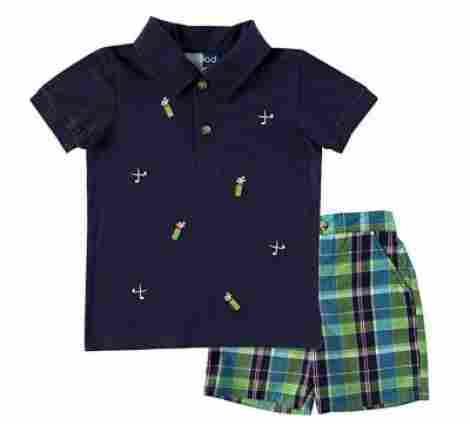 Made to be comfortable for the child, this is the Good Lad Infant and Toddler Boys Plaid short set. This product is cute, designed to last, and made to be a great outfit for any little kids. Here are two features. The material of this product happens to be a quality material design that ensures the shirt is easy for the parent to put on the child. With that, the shirt actually is also very durable and even machine washable considering babies and infants can get into a bit of a mess from time to time. However, the shirt is also made to be snag-resistant and very high quality. This product actually comes in a set. Individuals can expect a very cute shirt that has a navy color background alongside a polo design with golf embroidery. With that, the shorts are a cute and comfortable plaid short design with colors ranging from blue to green. Overall, not even your hole-in-one shots will distract other golfers from the cuteness that will be your child. Considering that this product is coming from such a great brand, we see this being of great value. More so, the product is built to last and the set is very high quality. With different sizes available, we recommend this set to any individual wanting their child to look dapper on the golf course. Very cute on any child. It is time to talk about a brand that excels in the area of design and quality. Commonly known as the most infamous brand in the sportswear industry, there is not one product that Nike has failed at. Therefore, individuals can expect this shirt to be of the best value. 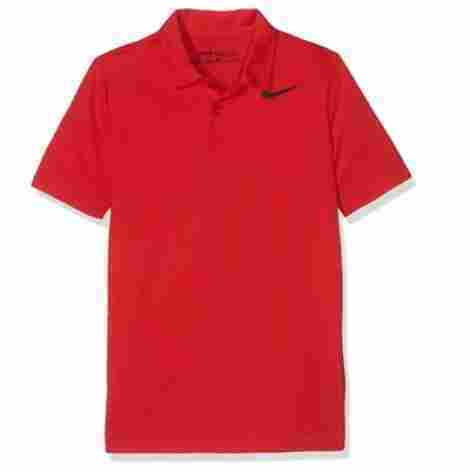 We want to talk about the Nike Boys Dry Victory Polo and two features of this product to consider. This product has the quality Dri-Fit Technology that we have come to expect from many of their excellent products. This Dri-Fit technology is intended to offer plenty of benefits such as wicking away sweat and making the product even more breathable. Overall, the fabric is high quality, comfortable and made to last. Alongside the technology, this brand guarantees durability with this fabric, which happens to be polyester. Parents can expect the fabric to be snag-resistant, easy to wash, and high quality. With that, this product is intended to be fade resistant. However, the red color is a vibrant bright red that may fade during the first wash.
As far as cost and value, this product is of the best quality and design benefits for little kids. This brand does not disappoint, and they are commonly known for producing some of the best items in the industry. Overall, we recommend this shirt if you are a parent that wants your son to look more and more like a professional golfer. 100% polyester fabric is durable. Dri-Fit technology is built to last. Comfortable fabric intended to keep your dry. The red one may fade. Although this brand is not as commonly known as other brands on this list, without a doubt that has built a name for themselves for producing excellent products. 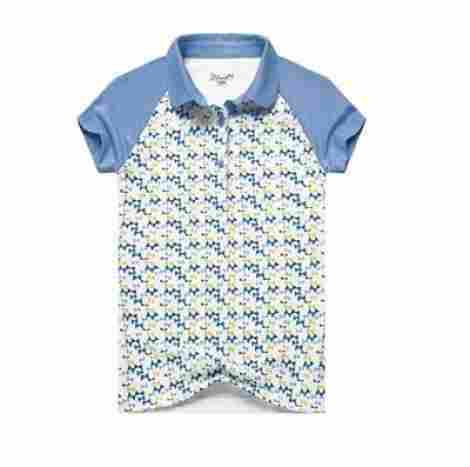 The Jitimao Girls Golf Shirts are a fan favorite among girls that want to play like the pros. The reason being is that it is one of the few brands that offer a slim fit design in their shirts. The fabric of this product is 100% polyester and overall has a cleaner and more comfortable fit alongside appearance. The tagless label design is intended to offer premium comfort and the fabric actually happens to also be anti-pilling. With that, this is a great casual everyday shirt for the girl that wants an excellent product design to wear on the golf course. Other features of the fabric include the fact that it is made to offer protection against the sun. With that, this brand comes with 35+ UPF protection so the individual does not get harmed by the sun’s harmful rays. More so, the fabric also comes with four-way stretch so no move is ever hindered by discomfort or lack of movement. Overall, we recommend this specific design if your daughter is looking for a cute shirt that has a slim fit design. More so, this shirt is built for specific sizes and ages and has premium features that we have come to know from adult shirts. With that, they are specific to ages five to fifteen and the color choices vary but are very stylish and cute. Overall, we recommend this shirt for the benefits and the style. Snag-free and resistant towards wear and tear. Beautiful colors to choose from. This last product comes from a brand that excels in the area of comfort and quality. 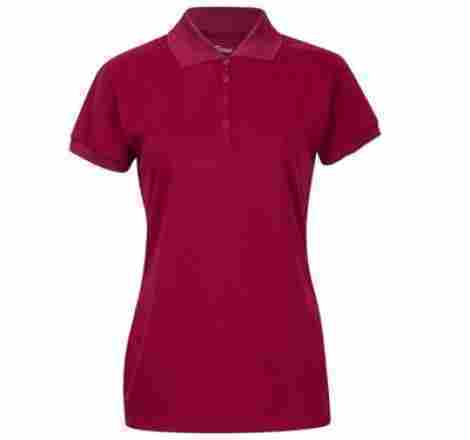 From the Premium brand, we want to share the Polo T-Shirt intended for junior girls. With a slew of benefits, this product is stylish, high quality, and has a performance fabric design that resembles the quality of the product. Here are two features to consider of this shirt. This fabric is one of the highest qualities and has features that are common among premium brands. For instance, the fabric is a soft and very lightweight fabric that is also odor-resistant. With that, girls can expect the fabric to be durable, comfortable to wear, and prevent any odor bacteria to build or soak into the fabric texture. Alongside this, it is designed to have an individual smelling fresh all day long. This product has a common fabric known as ‘Performance Fabric’ which is a specific fabric design intended for premium comfort. With this, individuals can expect this product to be moisture wicking, breathable, and designed to improve performance as well as remain new after multiple washes. With a large selection of colors to choose from, parents will find this product to be high quality and easy to wash. However, it is the girl that has to love it and little girls and juniors will love this as their next golf shirt. With this in mind, we recommend this product if you are looking for premium quality benefits without the cost of paying for a premium shirt. Moisture wicking and comfortable fabric. May fade in the wash. So, which of these outfits will your son or daughter be choosing? As we said, they all have many of our favorite features that we have come to know from some of the best brands in the industry. Of course, some of these brands were included such as Nike and Adidas. With this in mind, parents can expect that their child will appreciate the specific design, the quality and the overall look of the clothing and outfit. Now, if you are new to buying golf specific clothing for kids, it is important to consider the way you would buy it for yourself. Meaning, some of the many features that adults take into consideration for specific outfits, are the same features that are important when selecting the proper golf kids clothing. With this in mind, we want to move forward and share with our audience our criteria to evaluate the best kids clothing and outfits. This criterion is intended to shed some light on the best features and aspects to consider when looking for a quality child outfit. Let’s begin! Whether it was slim fit or relaxed fit. Variety of color choices to choose from. Different styles that can match with different bottoms, shorts or jeans. These were only a couple of the most common aspects that we took into consideration as far as the outfit physical appearance. This next criterion is a common criterion that we also use when selecting quality gear or outfits for adults. The reason being is that a golf outfit that is properly designed has to have a variety of important features to consider it as a quality product. With that, kids golf outfits are no different. We wanted to focus much of our research on the benefit of the outfit, not only for the child but also the parent. So, the following benefits are some that parents need to take into consideration when selecting a quality golf outfit for their kid. As the first benefit, breathability is an important factor to consider when selecting a quality outfit. The reason being is that breathability guarantees maximum comfort for the child. A breathable shirt will tend to have some kind of material such as spandex or polyester that tends to make the product more lightweight and comfortable. Breathability also makes the shirt more breathable on hot days. This next feature is common among golf clothing. A moisture-wicking shirt or outfit ensures that if an individual sweats, they will be able to be more comfortable than if the shirt was not moisture wicking. With this, many kids golf outfits actually have moisture wicking benefits and design available to ensure the child is comfortable all day when wearing the product. Many kids outfits for this sport tend to come with a four-way stretch design. This design is guaranteed to not hinder any movement out on the golf course. With that, a four-way stretch product is more comfortable and durable as far as design quality. Therefore, kids will enjoy the comfort and stretchiness of the product without feeling hindered or uncomfortable, as many kids can get anxious or uncomfortable after a while of wearing tight clothing. This feature may be one of the most important for parents to consider for various reasons. For a parent, their primary concern is sun protection for the kid. With that in mind, UV protection is a common concern when selecting the right outfit. Well, many brands create shirts that protect against the sun’s harmful rays. Therefore, we can say that this was a primary concern for us as well while conducting our research. When searching for a quality outfit, consider the UPF rating of the product. Many of what we have shared have a UPF rating of 30 – 60. A common concern of parents is how durable the shirt is. Without a doubt, we as parents are often concerned with the quality of a product just because we know the many messes our kids can get into. Well, a snag-resistant shirt is a great benefit to ensure the maximum durability of the product. As the last main concern that we took into consideration, we found that machine washable was a very important feature to consider, especially since kids can get a bit messy in their outfits. With that, all of the products we have shared are not only machine washable, but they are designed to be durable, high quality, and also fade-resistant while in the wash.
Now that we have shared with our audience the different criteria to consider when selecting a quality kids outfit, we want to answer some of the most common questions. Q: How do I know what size to pick? A: When selecting a specific size, it is important to consider the size chart that the brand has included. With that, many brands have different sizes available for their kids’ clothing. Therefore, the size chart can give some valuable insight as to the height, chest, and weight the outfit is intended for. Q: How do I wash this product? A: It all depends on the overall design of the item. However, most commonly a light or plain wash for kids’ clothing is suitable. Q: Is the clothing UV resistant? A: We have shared various UV resistant clothing on our list. With that, you want to take into consideration a product that is designed with a UPF rating. Now, the rating will vary depending on the product, the manufacturer, and the design. However, most commonly most brands that are creating clothing for outdoors will have this value. Q: What is the most comfortable fabric for kids clothing? A: Although cotton is commonly known as one of the most comfortable fabrics to consider. Polyester and spandex give quality features to the outfit that cotton cannot. For instance, spandex allows the product to be more durable and stretchier while polyester allows for moisture wicking benefits. With this, individuals want to consider the outfit material, especially since it is for golf.